Chris Lowther, newly appointed Chief Fire Officer, Tyne and Wear Fire and Rescue Service. 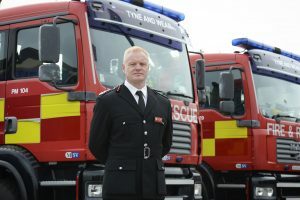 Tyne and Wear Fire and Rescue Service has announced the appointment of a new Chief Fire Officer (CFO)/Chief Executive. Following an extensive selection process, Chris Lowther, currently Assistant Chief Fire Officer, Service Delivery, will assume the role on Monday 10 April 2017 after it was announced last November that current Chief Fire Officer, Tom Capeling is set to retire from the service. Chris started his career as an operational firefighter based at Gateshead Community Fire Station in 1997. He has an impressive and varied background in training, community safety and operations and has taken a lead role in a number of national resilience programmes. Chris has held a number of roles within the fire and rescue service, including as a Station Officer for community safety, during which time he was instrumental in introducing home safety checks which have had a significant impact in reducing fires in the home. After joining the Strategic Management Team in 2009, Chis worked as an Area Manager and then in 2013 was appointed Assistant Chief Officer, assuming overall responsibility for services across five districts, operations, community safety and fire safety. Chris sits on the Operations Coordination Committee (OCC) – the lead body for Urban Search and Rescue (USAR) – and was the project executive for the national guidance work on transport. He has led on the introduction of Targeted Response Vehicles (TRVs), day crewing close-call shift patterns, Cobra Coldcut Technology and more efficient methods of staffing appliances whilst facilitating first class firefighter training. Policy and collaboration are integral to Chris’s current role and will continue to be a focus going forward. He works collaboratively with Northumbria Police and other key partners, and the implementation of the Integrated Risk Management Plan forms an important part of his remit. Chris Lowther said, “At Tyne and Wear Fire Rescue Service we strive to be the best service in the country. I am immensely proud of what we have achieved to date and am confident of what we can go on to achieve in the future. It is humbling to have been appointed Chief Fire Officer and I look forward to continuing to serve the community of Tyne and Wear – my community, and a community that I have served for twenty years. Chairman of Tyne and Wear Fire Authority, Cllr Tom Wright, said, “Chris will bring a wealth of experience and knowledge to the role of Chief Fire Officer. “Chris is a strong and dedicated leader and I have every confidence that we will continue to go from strength to strength under his direction. The safety of our local community is of paramount importance and I look forward to working together to ensure we maintain our reputation as being one of the best fire and rescue services in the country.